Hikers, bicyclists, photographers, sightseers, and writers make their way into the Smokies to partake of nature's finest Fall show. Hiking trails and bicycle trails provide majestic views of brilliant shades of yellow, orange, and gold as sugar maple, scarlet oak, sweetgum, yellow birch, red maple, dogwood, sourwood, maples, sassafras, and hickory trees change from their summer garments into glorious fall attire. Bicycle trails located throughout the park are invigorating as the cool mountain air gently falls on the faces of cyclists as they explore the beauty of a fall day. Bicycles are permitted on most roadways within the park. Steep terrain, narrow road surfaces, and heavy automobile traffic make some roads less desirable for a casual cyclist and should be enjoyed only by the most experienced. Several areas of the park are very popular for enjoying a bicycle ride. Cades Cove Loop Road is one of the most chosen bicycling areas. This 11-mile one way road provides bicyclists with opportunities for wildlife viewing and touring 19th century homesites and other historic structures. 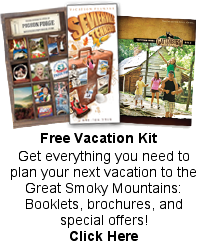 Bicycle can be rented at the Cades Cove Campground Store. Information is available by calling 865-448-9034. 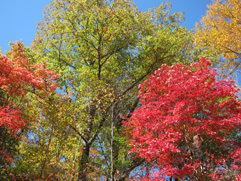 Other popular areas for bicycling are located in the Greenbrier and Tremont areas on the Tennessee side of the Smokies. 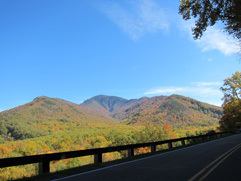 In North Carolina, the Cataloochee Valley and Lakeview Drive are beautiful areas to bike. There are two trails in the park which can be used for bicycling. The Gatlinburg Trail is accessible from the Sugarlands Visitor Center and travels 1.9 miles one-way to the outskirts of Gatlinburg, TN. The trail is fairly flat and runs through the forest alongside the Little Pigeon River. You will experience beautiful views of the river, a pedestrian foot bridge, and foundations of old homesites. A second trail, Oconaluftee River Trail, is accessible from the Oconaluftee Visitor Center and travels 1.5 miles one-way to the outskirts of Cherokee, NC. The trail runs through the forest and provides beautiful views of the river. The State of Tennessee requires that children age 16 and under wear a helmet. It is advisable for all riders to wear helmets. Hiking trails throughout the National Park offer solitude as you traverse along mountain ranges to enjoy the majesty of mountain vistas from atop a rolling mountain. Appalachian Trail - You may park your vehicle at the Newfound Gap parking area. At the cross-walk you will see a trail sign. Follow the trail to Indian Gap (where the trail meets Clingmans Dome Road). This is 3.4 miles roundtrip. Inspiration Point on Alum Cave Trail - You may park at the Alum Cave Trail parking area located on Newfound Gap Road (US 441) 10.5 miles south of Gatlinburg, TN. This 1.8 mile hike provides an opportunity to walk through rich, old-growth forest and offers views of the mountains. Look Rock Tower - This scenic road is accessible from Townsend, TN. Take US 321 to the Foothills Parkway to the Look Rock tower parking area. This moderate hike is 1 mile round trip. The views from the tower are spectacular! Sutton Ridge Overlook - Parking is available just before the entrance to Cosby Campground. The Lower Mount Cammerer Trail to Sutton Ridge is just past the amphitheater. It is only 1.4 miles to the 200-yard spur trail to the overlook. Oconaluftee River Trail - If you park at the Oconaluftee Visitor Center, you will discover the trail near the entrance to the historic buildings area. The trail follows the Oconaluftee River 1.5 miles to Cherokee, NC. @ 2012-2019 by Image Builders. All rights reserved.